Ya Te Veo takes as its title the name of a mythical tree that eats people. Like the branches of that tree, the poems in this book seem to capture and nourish themselves on a diverse cast of would-be passers-by, drawing their life-force from the resulting synthesis of characters. Among the seized are poets and painters alongside musicians from Garth Brooks to Wu-Tang Clan to the composer Morton Feldman, whose mysterious personality serves as a backdrop in many poems for meditations on intimacy, ethics, and anxiety. As the phrase “ya te veo” (“I see you”) implies, this is a book interested in revealing what we think is hidden, in questioning the gap inside all of us, a gap between what we feel and what we say and do, making space for our many contradictions. Like the works of Feldman, these poems focus and recede, experimenting with form in order to accomplish a state of deep concentration. They impersonate sonnets, ghazals, terza rima, monologues, translations, and freestyles, but inexactly, embracing failed imitation as an opportunity to remix the familiar. 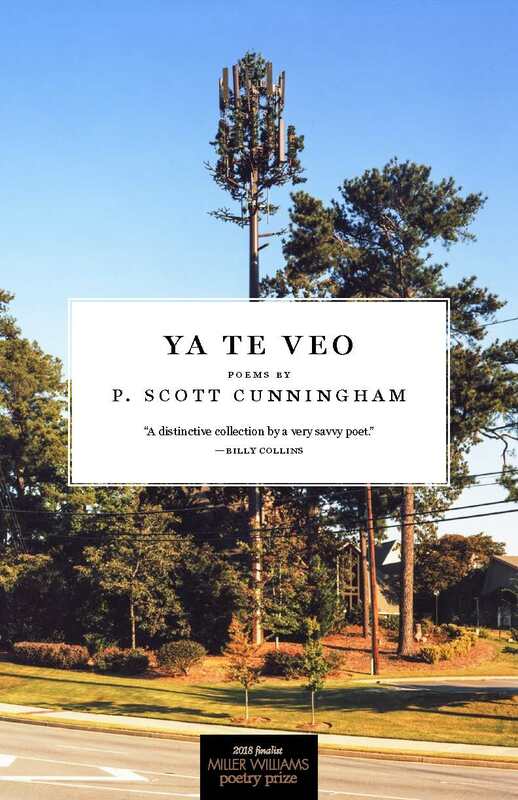 P. Scott Cunningham’s poems, essays, and translations have appeared in Harvard Review, The Awl, POETRY, A Public Space, RHINO, Los Angeles Review of Books, Tupelo Quarterly, Monocle, and The Guardian. He lives in Miami, Florida, where he serves as the director of O, Miami and the editor of Jai-Alai Books. Kyle Dargan was born in Newark, New Jersey. He earned his BA from the University of Virginia and MFA from Indiana University, where he was a Yusef Komunyakaa fellow and poetry editor of the Indiana Review. He is the author of four collections of poetry: The Listening (2004), which won the Cave Canem Prize, Bouquet of Hungers (2007), awarded the Hurston/Wright Legacy Award in poetry, Logorrhea Dementia (2010), and Honest Engine (2015). His poems and non-fiction have appeared in newspapers such as the Newark Star-Ledger, and journals such as Callaloo, Denver Quarterly, and Ploughshares, among others. Former managing editor of Callaloo, Dargan is also the founding editor of the magazine Post no Ills. He is the Director of Creative Writing at American University and lives in Washington DC. Sandra Beasley is author of three poetry collections: Count the Waves; I Was the Jukebox, winner of the Barnard Women Poets Prize; and Theories of Falling, winner of the New Issues Poetry Prize. Honors for her work include a 2015 NEA Literature Fellowship, the Center for Book Arts Chapbook Prize, and three DCCAH Artist Fellowships. She is also the author of the memoir Don’t Kill the Birthday Girl: Tales from an Allergic Life, which engages living with disability. She lives in Washington, D.C., and is on the faculty of the low-residency MFA program at the University of Tampa. Wesley Rothman is the author of SUBWOOFER (New Issues 2017), selected for publication by Mary Szybist and the New Issues Editors. His work has appeared or is forthcoming in Copper Nickel, Crab Orchard Review,Crazyhorse, Day One, Gulf Coast, Harvard Review, The Los Angeles Review, Mississippi Review, New England Review, Poetry Northwest, Prairie Schooner, Southern Humanities Review, Vinyl, Waxwing, the Poets on Growth anthology, & The Golden Shovel Anthology, among other venues. His criticism has appeared in Publishers Weekly, Boston Review, Callaloo, Rain Taxi Review of Books, & American Microreviews & Interviews. A Teaching Artist for the National Gallery of Art & recipient of a Vermont Studio Center fellowship, he lives in Washington, D.C.